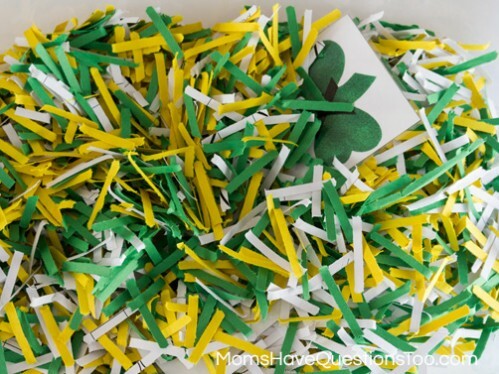 If you’ve been on my site at all, you know that I love sensory bins! I feel like they are such a great learning tool. When my kids use them they are super engaged, notice more detail in things around them, and even get better finger and hand strength. The results are obvious, but I’ve still always had a hard time explaining why those results come from sensory bins. But then! I was talking to my friend Adam who is an occupational therapist and he said he loves sensory bins too. I asked if he would write me a post about why and how sensory bins make kids smarter. He did and I was not disappointed!! Read on for an expert look at the importance of sensory bins. Vision: You see wisps of smoke entering between the cracks of your bedroom door. Hearing: You hear a loud crackling sound. Smell: You smell the strong smell of burning. Touch: You feel heat emanating from your bedroom door. Each of these separate sensory signals are being sent to different parts of your brain simultaneously. 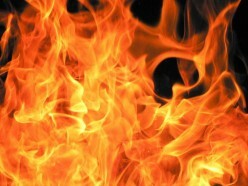 The brain almost instantaneously pieces that informational puzzle together and develops an interpretation: FIRE! You rush to safety out your bedroom window. Sensory Integration is that process of experiencing sensory input (i.e., seeing smoke, smelling smoke, feeling heat, hearing crackling), interpreting that information (i.e., “FIRE!”), and acting upon the interpretation (i.e., “I have to get out of my room”). Each day, we experience this process thousands of times (though hopefully in less extreme ways than our house burning down). It is so automatic that we don’t even realize we are doing it. We are able to do this instantly because from the time we were born we have been exposed to various senses and our brains learned how to interpret them one step at a time. Some children experience sensory input differently than others. They may yell or flinch when being touched, plug their ears to seemingly “normal” sounds, or slam doors and push on crayons and pencils too hard. They are experiencing the senses, but not accurately interpreting the information. This causes them to act or react in undesirable ways. 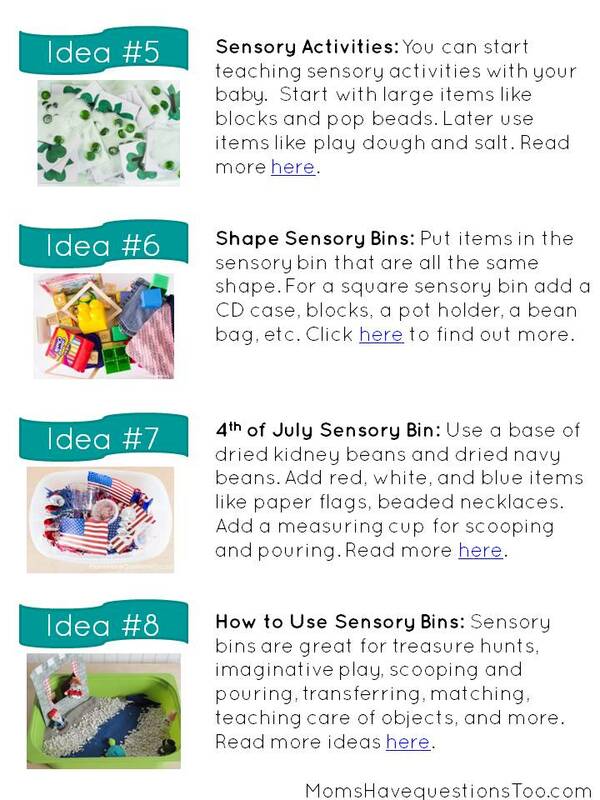 If your child shows these or similar signs, providing them with sensory opportunities (like sensory bins) helps them learn to make sense of sensory information. Even if your child doesn’t show any of these signs, they still need frequent sensory experiences to develop, learn, and grow. Sensory bins provide a myriad of tactile (touch) input for kids to experience! Wet, dry, squishy, hard, pointy, soft, etc. Signals are being sent to the brain, and the brain is put to work making sense of it all. This helps foster appropriate brain development. Most importantly to the kids, it is FUN and provides social opportunities for kids to participate in. Thank you so much Adam for this perfect explanation! 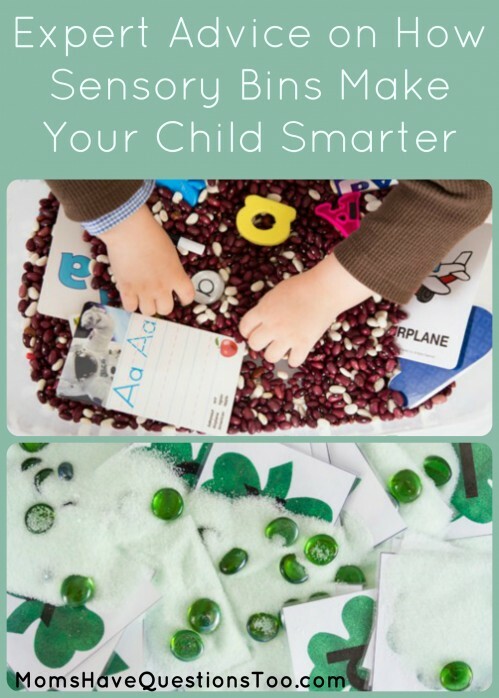 If you’re like me, you probably want to set up a new sensory bin right now. 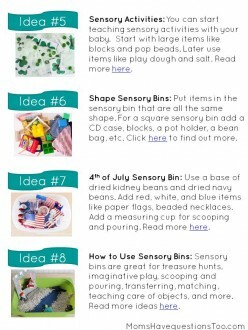 Download this free pdf with 8 Sensory Bin Ideas. 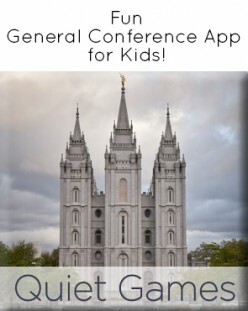 Please share this post on facebook, pinterest, or twitter. 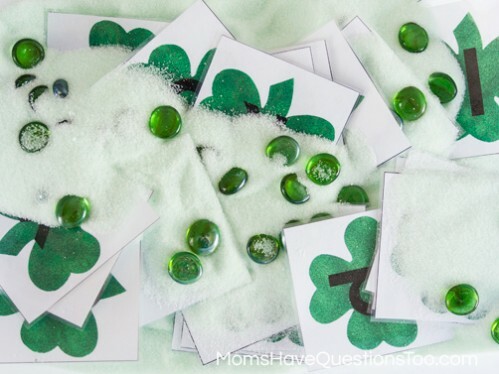 For more teaching ideas head over to the sidebar and subscribe to Moms Have Questions Too.